WASHINGTON—On September 27, 2017, the Administration, in a consultation with Congress, proposed to only admit up to 45,000 refugees to the United States in fiscal year 2018. This Presidential Determination (PD) for Refugee Admissions is the lowest since the founding of the program in 1980 and marks the second consecutive year that the new Administration has reduced the PD. Currently there are 65 million displaced people and 22 million refugees worldwide. “We are disturbed and deeply disappointed by the proposed Presidential Determination number of 45,000 for the upcoming fiscal year. While the Catholic Bishops, Catholic Charities, and Catholic communities across the country join in welcoming all of those refugees to American communities with joy and open arms, we are gravely concerned for the tens of thousands of extremely vulnerable refugees left behind by this decision. “As I have stated before, this decision has very severe human consequences—people with faces, names, children and families are suffering and cannot safely or humanely remain where they are until the war and persecution in their countries of origin gets resolved. These people include at-risk women and children; frightened youth; the elderly; those whose lives are threatened because of their religion, ethnicity or race; and refugees seeking family reunification with loved ones in the United States. “Each refugee that comes to the United States is admitted through an extensive vetting system. Many of these refugees already have family in the United States, and most begin working immediately to rebuild their lives; in turn contributing to the strength and richness of our society. God has blessed our country with bounty and precious liberty, and so we have great capacity to welcome those in such desperate need, while ensuring our nation’s security. On Wednesday, September 27th, we held a webinar on Temporary Protected Status or TPS. Listen to our experts break down all the information you need on this important topic. WASHINGTON, D.C., SEPTEMBER 27, 2017 – Today, several dozen bishops across the United States are joining Pope Francis as he launched the two-year “Share the Journey” campaign, holding events and reaching out to support migrants and refugees in their own dioceses as the campaign aims to raise awareness about their plight worldwide. More information about “Share the Journey” is available on sharejourney.org. On Wednesday, September 20th, we held a webinar to talk about the Deferred Action for Childhood Arrivals or DACA. Below are the slides from the webinar as well as a recording of the webinar featuring our panel of experts. 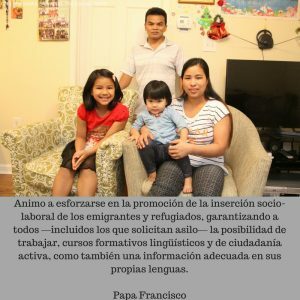 We write on behalf of the Catholic Legal Immigration Network, Inc., (CLINIC), Catholic Charities USA and the U.S. Conference of Catholic Bishops’ Office of Migration and Refugee Services (USCCB/MRS) to highlight the needs of certain Deferred Action for Childhood Arrivals (DACA) recipients in the wake of Hurricanes Harvey and Irma. In light of the terrible devastation wrought by these hurricanes, we urge you to provide impacted youth applying for DACA renewals with an extension of the filing deadline and an opportunity to qualify for fee waivers. The U.S. Catholic Bishops and Catholic Charities USA have long supported DACA youth and have worked through the national Catholic Charities ministry to assist eligible young people file their applications and renewals. CLINIC’s network of over 300 legal services providers have assisted tens of thousands of DACA applicants. Since 2012, we have done this work in partnership with the Department of Homeland Security, promoting public engagement and education on DACA and also helping to prevent incidents of notario fraud. This work has been rooted in our faith. As Catholics, we believe that the dignity of every human being, particularly that of our children and youth, must be protected. With some of the largest populations of DACA youth living in Texas and Florida, we know that these individuals were among those whose lives were upended by Hurricanes Harvey and Irma. These hurricanes, which brought with them torrential rainfall and winds over 130mph, wrought heartbreaking devastation upon Texas, Florida, Louisiana, Georgia, and South Carolina. Initial estimates suggest that the storms caused $150 to $200 billion worth of damage to homes, furnishings, vehicles, real estate, and public infrastructure. USCCB, Catholic Charities USA and local Catholic Charities agencies have been working heroically to raise resources, build response teams and assist the impacted communities. However, it will likely take months, if not years, to rebuild and replace what was lost. In the September 5, 2017 memorandum on the rescission of the 2012 DACA program, the Administration determined that current DACA recipients whose status is set to expire between September 5, 2017 and March 5, 2018 may apply for a two-year renewal of DACA. The filing deadline for such applications was set for October 5, 2017. In light of the substantial devastation caused by Hurricanes Harvey and Irma, however, we request a three-month extension of the filing deadline for renewal -eligible DACA youth living in areas impacted by the hurricanes. These young people were among those evacuated and among those who returned to find their homes flooded and their personal belongings destroyed. Like many others, the current focus for these DACA youth is – as it should be – on restoring basic stability to their lives. As such, a short filing extension is warranted and ensures that they will not be unduly disadvantaged. Additionally, we request that you provide the ability for impacted DACA youth to apply for fee waivers for their renewal applications. The economic toll of the hurricanes was massive; for many, their savings will need to be spent rebuilding homes and replacing basic necessities. DACA youth who do not have the means to pay $495 filing fee due to the hurricane however, are not less deserving of the opportunity to renew their status and we request you evaluate fee waivers in certain demonstrable hurricane devastation-related situations. In the wake of great tragedy, we must come together as a nation to support all those whose lives have been upended. We respectfully ask for a short extension of the renewal filing deadline and limited fee waiver opportunities for DACA youth impacted by the hurricanes. We strongly believe that doing so would be both the humane and the just course of action. We appreciate your consideration of our requests and would welcome the opportunity to answer any questions you may have or meet with you on these and other issues related to DACA. 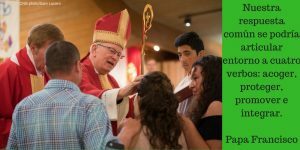 “The Executive Committee of the USCCB, meeting this week, makes its own the Statement of the USCCB President and others on September 5th, which expressed extreme disappointment with the administration’s decision to end DACA with a six month wind-down period, and committed the USCCB to redouble its efforts to help find a permanent legislative solution in Congress. “In light of many years of failure by Congress, whether controlled by Republicans or Democrats, to address the situation, the Committee urges the Catholic faithful and all people of good will to contact their representatives in Congress to urge the passage of the DREAM Act or similar legislation as a prompt, humane, and durable solution to this problem of greatest urgency. The Executive Committee also notes the tremendous contributions of the DACA youth to date as extraordinary, including the fact that many serve in our military. “In the wake of Hurricanes Irma and Harvey and the devastation left behind, the Executive Committee requests that the Department of Homeland Security extend the October 5, 2018 deadline for the DACA renewals that fall within the October 5- March 5, 2018 renewal period for those living in hurricane-affected zones. As Texas and Florida have some of the largest populations of DACA youth, we ask that you ensure that these individuals receive fair access to renew and are not unduly punished due to natural disaster. We fear that they cannot adequately do so at this time given the physical damage on the ground. “The Committee is further troubled and deeply concerned, as the President nears a final decision to reduce the number of refugees welcomed in the United States by 50%, that the administration will unduly restrict our reception of those in search of safety for their families. The USCCB proposes that 75,000 refugees, already a reduction of over 25% from the previous determination, be the goal for welcoming refugee admissions for 2018. Going further down to 50,000 or below, as proposed in previous Executive Orders by the President, is simply inhumane, particularly when our great nation has the resources and ability to do more. “We implore the administration to show mercy and compassion for those seeking refuge, and to advance the American value of freedom through providing safe harbor to those fleeing tyranny and religious persecution. I write on behalf of the U.S. Conference of Catholic Bishops’ Committee on Migration (USCCB/COM) to express our serious concern regarding H.R. 3697, the “Criminal Alien Gang Member Removal Act,” which is being considered by the full House for a vote this Wednesday, September 13, 2017. We urge you to reject H.R. 3697 as it is a very broad bill that could contribute to victims of criminal gangs facing detention and being barred from seeking protection in the U.S. 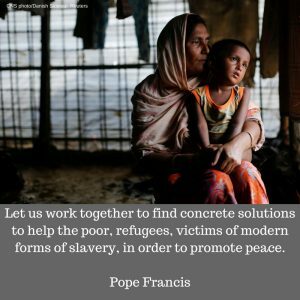 The Catholic Church has significant interest in the protection of vulnerable immigrants and asylum seekers. The Catholic Church’s work in assisting immigrants stems from the belief that every person is created in God’s image and should be treated with dignity and compassion. While the Catholic Church recognizes governments’ sovereign right to control their borders, we believe this right should be balanced with the right of immigrants to access safety and due process. Jesus himself was a migrant, and the Holy Family, a migrant family fleeing persecution from King Herod. The USCCB works to fulfill the teachings of the Church on migration through our work providing resettlement services to refugees, services to unaccompanied immigrant children, and case management services to human trafficking victims in the United States. Violence in El Salvador, Honduras, and Guatemala (the Northern Triangle of Central America) remains the primary force driving citizens to flee and seek protection. We have seen firsthand from our work with unaccompanied children and their families the increasing threat posed by gangs and forcible gang recruitment in the Northern Triangle. Moreover, the United Nations’ refugee-protection agency (UNHCR) found that the majority of children fleeing the Northern Triangle “were forcibly displaced because they suffered or faced harms that indicated a potential or actual need for international protection.” Alarmingly, however, H.R. 3697, would deny critical protection to many of these children and their families. H.R. 3697 establishes both an expansive definition of “criminal gang” and a low threshold for association with such a group. The bill allows those whom the government merely has “reason to believe” have ever been gang members or those who have participated in any activities of a designated group as inadmissible, deportable and subject to mandatory detention. Additionally, because of such a perceived “association” by the government, these individuals would be unable to access several vital forms of legal relief, including asylum, Temporary Protected Status, and Special Immigrant Juvenile Status. Given these severe consequences, we are particularly concerned that H.R. 3697 provides no exemption for children or other individuals who were victims of gangs and or individuals who were forced to engage in gang-related activities under duress. We fear that under H.R. 3697 there will be victimized children who will be considered “associated” with criminal gangs. This concern is reinforced by the stories of the children we serve daily. They are children like Mariana who was 16 when the local gang began to target and harass her in her home country of El Salvador. Mariana lived in constant fear after the gang began to threaten her and her family, ultimately forcing her to smuggle a package of drugs to another neighborhood in El Salvador. After this incident, Mariana fled to the U.S. to escape the growing daily threat of the gang and also to avoid forcible recruitment. Mariana is living with her mother now while she complies with her immigration proceedings. Sadly, we know Mariana is just one of many children from the Northern Triangle trying to flee gang violence. H.R. 3697 would deny such children safety, forcibly returning them to situations where their wellbeing and even their lives would be at risk. We should not be turning our back on children and families who have fallen victim to and are fleeing from the very criminal organizations which our country is so diligently working to eradicate. Rather, these victims are deserving of our compassion, care, and protection and should be encouraged to tell their stories so that we may adequately bolster our prevention and child protection work. Our committee understands and appreciates your commitment to the safety and security of our nation. H.R. 3697, however, is not the answer. We must resist the urge to mischaracterize and mislabel victims in search of a safe haven. We urge you to reject H.R. 3697 and instead work towards immigration reform that addresses root causes and safe repatriation and integration. And we pray that the all victims of criminal gangs – regardless of their immigration status – find peace and justice.